Successfully Added Android TV Box M96X - 4K, Android 7.1, WiFi, Miracast, Quad-Core CPU, 2GB RAM, Google Play, Kodi V17.1 to your Shopping Cart. 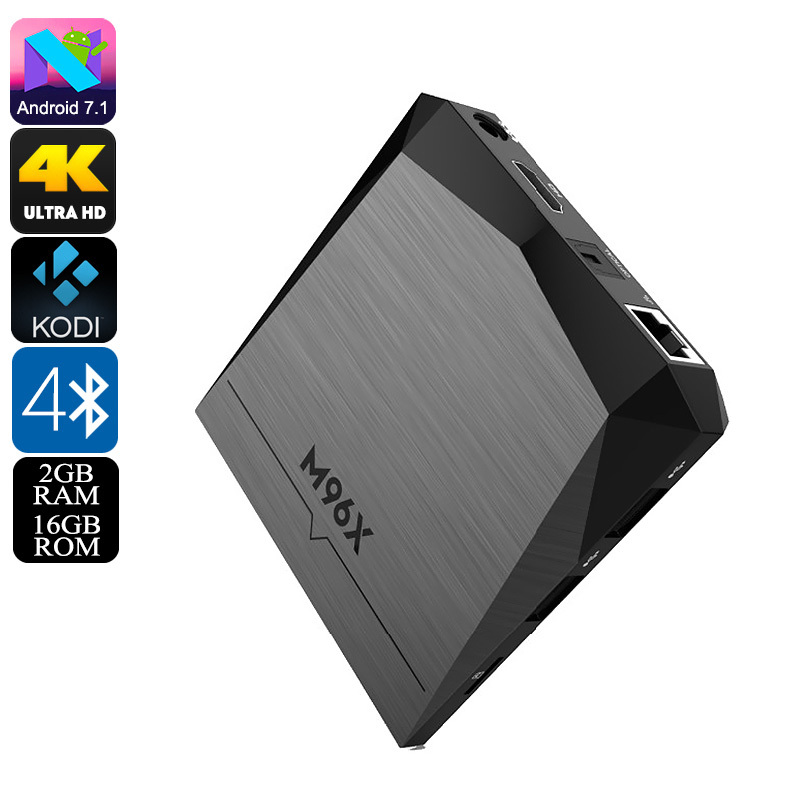 The M96X Android TV box is the perfect home entertainment system that keeps you and your family entertained for years to come. Coming with both Google Play and Kodi TV, this 4K TV box lets you access millions of the latest free to download media files. Download games, films, or Apps – nothing is impossible with this Android TV box. It treats you to 16GB internal storage that can be extended via its 32GB SD card slot. This means that you’ll have plenty of space available to keep your files. Whether you like to watch a film with your family or a sports game with your mates – this Android TV box keeps everybody entertained. Android 7.1 puts forth a smooth performance. You’ll be able to effortlessly use the latest Software features without encountering any lag or delay. Your Android TV box furthermore comes with a Quad-Core processor, 2GB RAM, and the ARM Mali-450 Penta-Core graphic’s unit. With this hardware at your side, you’ll be able to tackle demanding Apps and games without dropping a frame. With WiFi support, you can browse the web at any time from your big screen TV and instantly stream or download media. This truly turns your TV box into a media player that comes with unlimited entertainment possibilities. By supporting 4K resolution, the M96X Android TV box lets you watch the latest Ultra-HD movies and series. This 4K TV box lets you undergo a visual experience like never before. You can enjoy vivid color and extreme details whenever you turn on this little beauty. This will truly enhance your media experience. Grab some snacks, sit back, and put on your favorite movie – with this Android TV box in your home, you’ll never have to feel bored again. The M96X Android TV box comes with a 12 months warranty, brought to you by the leader in electronic devices as well as wholesale Android media players..